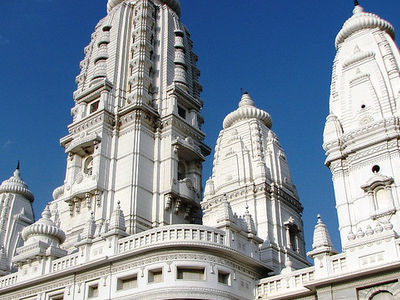 The JK Temple is a temple in the Indian city of Kanpur. Considered to be a unique blend of ancient and modern architecture, its mandapas have been constructed with high roof for adequate ventilation of light and air. The J. K. Trust has constructed this temple. The major maintenance expenses of the temple also come from the trust fund. The temple also known as Radhakrishan Temple. Beautifully constructed, J.K. temple is a boon to the devotees. Built by J.K. Trust this architectural delight is a unique blend of ancient architecture with the modern. The even-level roofs or the mandaps have been provided with adequate ventilation for sufficient light and air. Among the five shrines that the temple has the central one consecrated to Shri Radhakrishna and the other are adorned with idols of Shri Laxminarayan, Shri Ardhanarishwar, Shri Narmadeshwar and Shri Hanuman. There is park and beautiful lake near the temple which looks wonderful at night when lights are on. Construction of the temple was completed on 20 May 1960. It celebrating its 50 years on 20 May 2010. It was made by the Singhania family. As the JK Temple is a very preserved modern architectural building, no fee is taken for entry and checking is done through a metal detector. Here's the our members favorite photos of "Temples in Kanpur". Upload your photo of Shri Radhakrishna Temple! So far only Saroj Bhatta wants to visit Shri Radhakrishna Temple. Do you want to visit Shri Radhakrishna Temple Click here?